From Wikipedia, the free encyclopedia : Yellow journalism, or the yellow press, is a type of journalism that presents little or no legitimate well-researched news and instead uses eye-catching headlines to sell more newspapers. Techniques may include exaggerations of news events, scandal-mongering, or sensationalism. By extension, the term yellow journalism is used today as a pejorative to decry any journalism that treats news in an unprofessional or unethical fashion. Todd Babiak called me (Doug Brinkman) the day after his story made it to the news stands, to say his newspaper received 100s of letters in response to his story. He said some of the letters were not very nice. He promised his newspaper would publish 3 letters in support of 9/11 truth. Todd and his editors kept their promise. Last month’s Sandy Hook school shootings spawned a debate about gun control among mainstream American politicians and pundits. Among American kooks, on the other hand, the killings spawned a bizarre-seeming set of conspiracy theories, which imagine that Adam Lanza’s slaughter of a classroom full of elementary school children in Connecticut was all part of some diabolical Obama-masterminded plan to take away Americans’ assault rifles. A YouTube video that sets out the conspiracy theory (in somewhat tedious detail) has been viewed more than 11 million times. It’s lurid and it’s bizarre. Yet in two crucial respects, Sandy Hook conspiracism isn’t much different from all the other flavours of paranoia we’ve witnessed in recent years, including the Obama Birthers and the 9/11 Truthers. Archie's Creek on Mon, 02/04/2013 - 11:41pm. are you saying that Alex and his team present " little or no legitimate well-researched news"? ProfJones on Tue, 02/05/2013 - 11:28am. 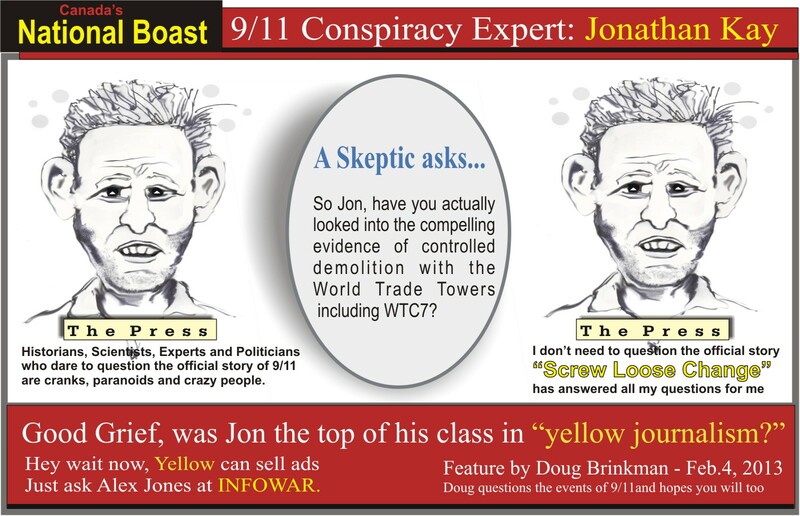 Professor Jones: My Wife and I met you and your wife after your presentation regarding the WTC dust at the Vancouver 9/11 Truth conference in 2007, - After that conference and for the next 6 years I continued on working as a full time activist in the 9/11 truth movement, while my wife (a non 911 Truther - but one who supports a new investigation into the events of 9/11) worked full time as a researcher on topics such as conspiracies, hoaxes, satanism and fear-mongering. She developed two web-sites "Swallowing The Camel" and "Leaving Alex Jonestown" challenging erroneous plots and stories with intense research, eventually debunking some of the weakest conspiracies including those that developed their own life with-in the 9/11 truth movement. Her work has been referenced by both media and the people in the 911 truth movement over the years. Jonathan Kay also interviewed her, while he was writing his book "Among The Truthers". LEAVING ALEX JONESTOWN - Alex has said countless times on air "Don't Take My Word, Check it OUT FOR YOURSELVES!" We have to ask ourselves what do any of the following listed conspiracy theory topics have to do with the 9/11 conspiracy from a guy who claims he is the leader of the 9/11 truth movement? As a 9/11 activist and founder of Edmonton 911 Truth , some of these topics listed above such as vaccines, fluoridated waters, Flu Shots conspiracies had on many occasions over the years found there way into our 9/11 public actions - Many infowar members had tried to introduce these unrelated conspiracies into our group but were met each time with my resistance - "We are here as activists for the 9/11 conspiracy and pursuing a made in Canada investigation of 9/11, not an extension of Alex Jone's infowar unrelated conspiracy world . This caused infighting and division eventually breaking up the Edmonton 9/11 Truth group after 5 years of actions. I have long maintained myself that Alex Jones and his radio peers in Austin who have access and popularity in media are more of a detriment than good for the 9/11 truth movement. 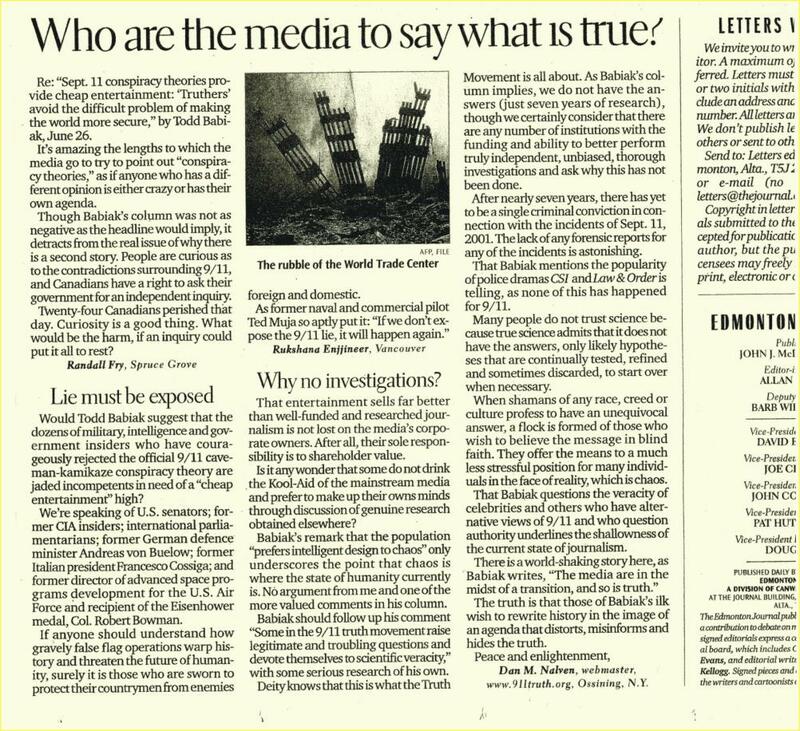 Similarities tie both Alex Jones and his peers of the profit driven radio industry to the newspaper industry that Jonathan Kay works for as editor of the National Post newspaper that's part of the largest chain of newspapers in Canada owned by Post Media Inc. Both have a special interest in the 9/11 truth movement and do many stories on the topic. Both have a large audience and are influential in effecting public opinion on social and political issues. Both do not research much of the content before it's published on air and in print - Kay himself claims in his book " Among The Truthers" he was not interested into looking into the work by the 911 truth movement's as the 911 Commission Report, Popular Mechanics and Screw Loose Change have done all the research for him - He actually refers his readers to " Screw Loose Change" for the truth behind 9/11 - go figure? Archie's Creek on Tue, 02/05/2013 - 4:13pm. What do the numbers in (parenthesis) indicate? Joe on Tue, 02/05/2013 - 9:55pm. Archie's Creek on Wed, 02/06/2013 - 4:56am.